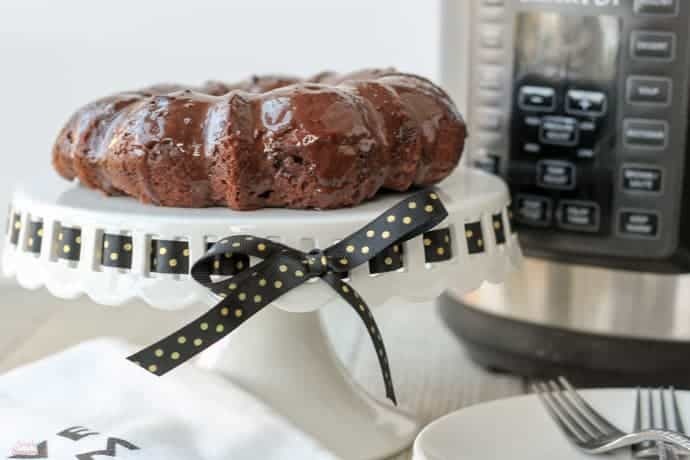 Pressure cooking will never replace baking, but with recipes like this Crockpot Express Triple Chocolate Cake, it can certainly come in as a close second! Fudgy cake, chunky chocolate chips and creamy ganache make this a chocolate lover’s dream come true! I wanted to try dessert in my Crockpot Express just to see if pressure cooking can come anywhere close to actual baking. The answer is yes, if you use the right kind of recipe. Things like pie and flaky desserts that need dry heat obviously won’t work. 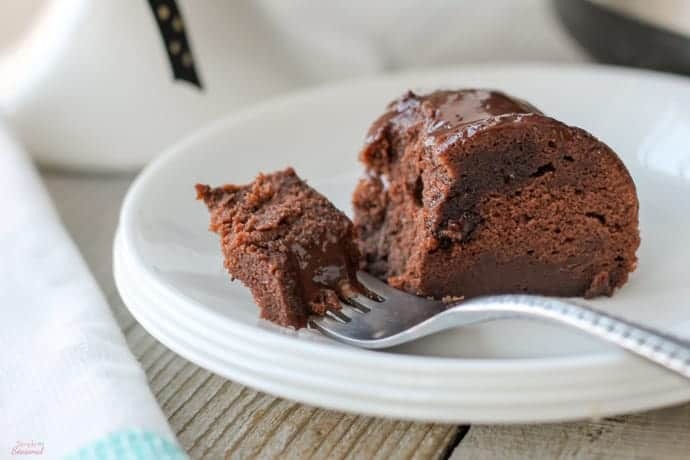 But gooey desserts like cobblers, lava cakes and this Crockpot Express Triple Chocolate Cake are perfect for pressure cooking. I’m adding it to my list of Crockpot Express Recipes!<—Click to see more! 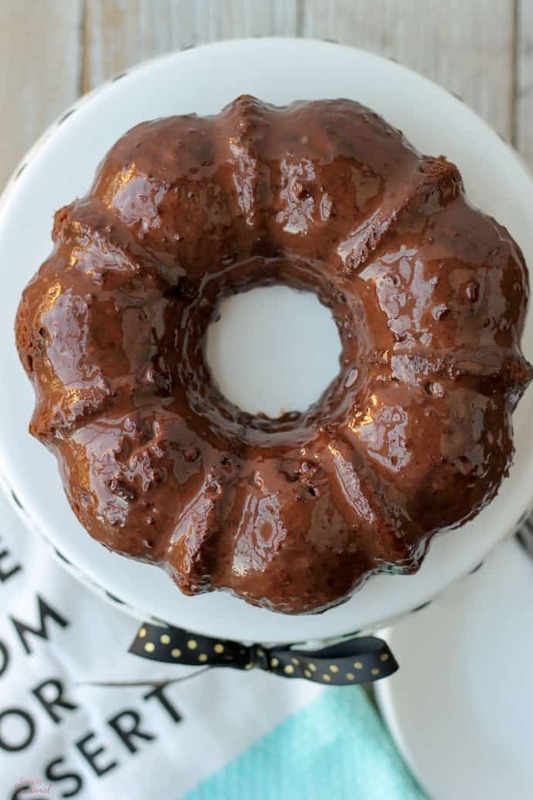 One of the first accessories I bought for my Crockpot Express was a 6 cup Nordic Ware Bundt pan for desserts recipes like this. It’s also perfect for Crockpot Express Banana Bread or things like Pressure Cooker Corn Bread. I tried making corn bread casserole in a spring form pan when I first got my CPE, but it didn’t cook all the way through. I definitely think this pan is a better option for “baked” things. 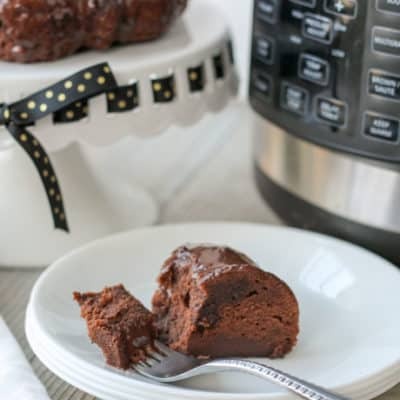 Pressure cooking will never replace baking, but with recipes like this Crockpot Express Triple Chocolate Cake, it can certainly come in as a close second! Fudgy cake, chunky chocolate chips and creamy ganache make this a chocolate lover's dream come true! Generously grease a 6 cup Bundt pan. Set aside. In a medium mixing bowl, mix cake mix and pudding until combined. Make a well in the center. Add the liquid ingredients. Mix on low until blended, then on med/high for 3 minutes. Fold in the chocolate chips. Spoon batter into prepared pan. Be sure to spread it evenly throughout the pan! Cover tightly with foil. Place trivet in the inner cooking pot and pour in one cup of water. Using a sling, lower the Bundt pan into the cooker. Cover, turn steam release valve to "closed" and press Desserts. (Low Pressure) Set time for 25 minutes. After cooking cycle has ended, do a quick pressure release and remove pan to a cooling rack. Cool for 10 minutes in the pan and then turn out onto a cooling rack to add ganache and finish cooling. In a small saucepan, bring the heavy cream just to a boil. Place the chocolate chips into a medium bowl and pour the hot cream over the top. DO NOT STIR. Allow to sit uncovered for 10 minutes. After the cream has cooled for 10 minutes, gently stir until the melted chocolate and cream blends into a smooth, shiny chocolate ganache. Place a baking sheet under the wire rack and pour the chocolate ganache over the cake. Save the excess ganache to use as frosting, or pull it back out and pour it over the cake for a second coat. Allow ganache to set, then slice and serve! Grab some cold milk because it's rich! If this recipe looks familiar, it’s because I just took my recipe for Chocolate Lovers Bundt Cake and tweaked it to fit in the CPE. 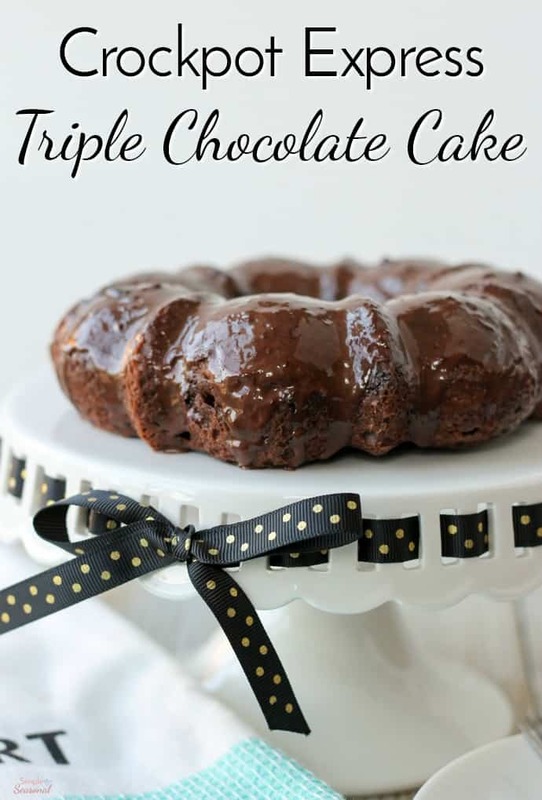 My husband said he actually liked the Crockpot Express Triple Chocolate Cake version better!